Nipo Strongheart (Chtu-Tem-Nah) Yakima Nation declared as a Baha’i between 1961-62. As a child he and his father toured with Buffalo Bill’s Wild West show as bare back trick riders. Nipo was 10 or 11 years old. He was the first Native American to enlist in the provisional regiment which Roosevelt recruited in 1917. Nipo along with 18,000 other Native people served in the world war. He was a noted actor and technical advisor to Hollywood especially regarding films about Native Americans. 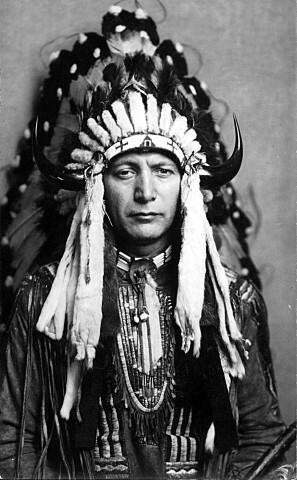 He helped form the National Congress of American Indians and it is said he authored the Indian Citizenship Act of 1924 signed by President Coolidge. He was a field representative for the Society of American Indians and accompanied the Yakima delegations to Congress in the 1930-50s. Cecil B. DeMille wrote and produced a biography of him. There is so much to say about our relative Nipo Strongheart and I’ll add more as soon as I can.